Crews are clearing out a large homeless encampment hidden out of sight. It’s so big, it’s taking crews three days to clear the area in Webster. 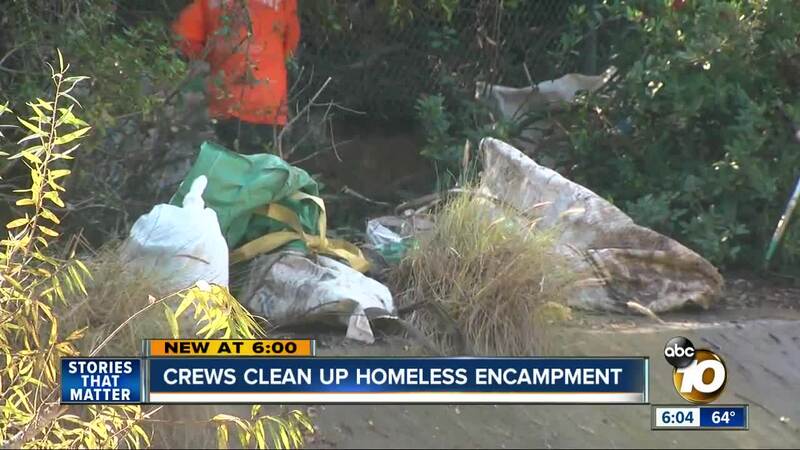 SAN DIEGO (KGTV) — Crews are clearing out a large homeless encampment hidden out of sight. It’s so big, it’s taking crews three days to clear the area in Webster. Trash, soiled clothes and old food containers is only a small list of what the eight man crew had to clean up. The Alpha Project Abatement team cleared a stretch of Federal Boulevard. The homeless camp was tucked away near a flood channel. Driver says most of these camps are not easily seen. The Alpha Project crew is contracted with the City of San Diego. They work with the city’s Environmental Services Department to clear the mess. “Sometimes the people are here but usually they’re packing up and leaving once we get here,” says Driver. Police were on hand to make sure crews were safe. The city gave the people living there about a week’s notice about the cleanup. The Alpha Project offers a number of resources for the homeless, including a bridge shelter in downtown. If you need to report a homeless encampment with the city of San Diego, officials recommend you use the city's Get It Done app .